Laura Muir wins gold in the women's 1500m to complete a second successive European Indoors double after winning the 3,000m earlier in the championships. Great Britain's Tim Duckworth seals his heptathlon silver medal after the 1000m event at the European Indoor Championships in Glasgow. Great Britain's Shelayna Oskan-Clarke controls the women's 800m final to win an emphatic gold medal at the European Indoor Championships in Glasgow. Great Britain's Jamie Webb holds on to win silver, with Ireland's Mark English claiming bronze in the men's 800m final at the European Indoor Athletics Championships. Asha Philip adds to Great Britain's medal tally on day two of the European Indoor Championships with a bronze in the women's 60m final. GB's Chris O'Hare wins silver in the men's 3,000m at the European Indoor Championships, separating Norwegian brothers Jakob Ingebrigtsen in gold and Henrik in bronze. 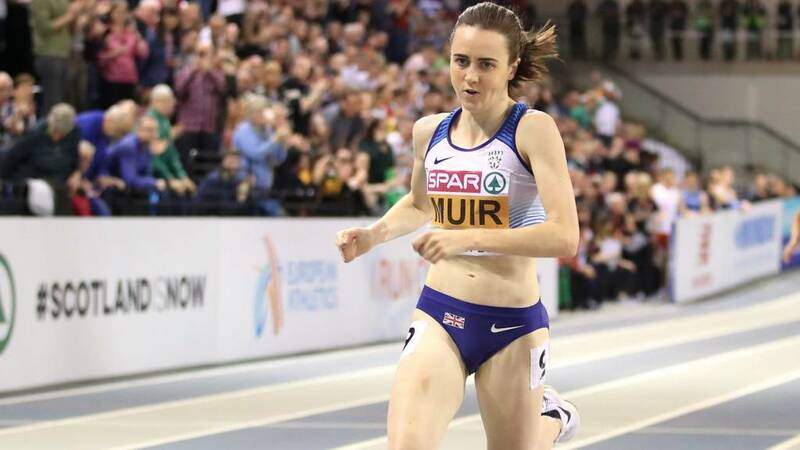 Laura Muir storms to 3,000m gold by almost lapping the entire field to cross the line in eight minutes 30.62 seconds at the European Indoor Championships in Glasgow. Katarina Johnson-Thompson wins pentathlon gold at the European Indoor Championships as fellow Briton Niamh Emerson takes silver. Laura Muir heads to Glasgow hoping to start a golden year with success in the 1500m and 3000m in the European Indoors before 1500m glory at the World Champs in Doha in September. "It is just a matter of executing on the day," she said. "I showed that in the Diamond League final last year, which was the equivalent of a global final. "I would love to get on the podium in Doha. That really would tick the last box for me." Find out what else Muir had to say to BBC Sport's Tom Reynold's - including the debate with her coach about getting a post-Olympics dog - here. Former 1500m world champion Steve Cram has picked his British athletes to watch at the European Indoor Championships, which begin on Friday in Glasgow. Cram, who will again be part of BBC's commentary team, expects the team to shine on home soil over the three days of competition. He said: "I think we want to be top of the medal table here. "We'll have successes and win a lot of medals - hopefully a lot of golds." You can find out who Cram thinks will shine here. How can I watch the European Indoor Championships? You can watch live coverage from all three days of the European Indoor Championships from Glasgow on BBC TV, and on the BBC Sport website and app at the top of this page. All the action will also be available on the BBC iPlayer, where you can catch up on each day's coverage shortly after each broadcast. What is it and who's taking part for Great Britain? Since its introduction in 1970, the European Indoor Championships has become one of the most prestigious events on the Indoor circuit. Despite starting as an annual event, it is now held once every two years with the 2019 competition being held in Glasgow. Among the Brit's Laura Muir, Asha Philip, Richard Kilty and Andrew Pozzi will all be aiming to defend the titles they won two years ago in Belgrade. Guy Learmonth will captain GB's team in Glasgow. The 26-year-old secured his place after winning 800m silver at the British championships and will follow in the footsteps of Andrew Pozzi and Dai Greene, fellow middle-distance runner Shelayna Oskan-Clarke and fellow Scot Eilidh Doyle in being chosen by his peers to captain the team. After winning a bronze medal in last year's European Championships, Holly Bradshaw is vying for gold in the pole vault. You might want to be the next Mo Farah, or just want to get fit and see how well you can do - either way, athletics can be the sport for you. It includes a huge variety of disciplines, so whether you want to run, jump or throw you can find an activity that suits you. For more information, you can check out our handy guide or find local athletics opportunities in England,Northern Ireland, Scotland and Wales.